Restaurants are branching out with gourmet food trucks to capture fast-growing trend. Food trucks allow restaurants to experiment with new offerings. Nothing beats escaping the office for a summer lunch outside. Maybe you were organized enough to pack your lunch. Even better: Your favorite restaurant rolls up to the curb and hands you a paper carton of teriyaki chicken nestled on a bed of steaming rice. 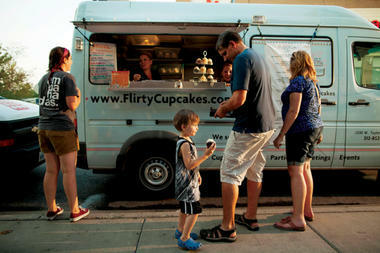 From grilled cheese to cupcakes to the latest fusion cuisines, a growing number of food trucks are roving city streets as patrons – and now restaurants – discover the ease, ingenuity, and affordability of sidewalk meals. Street vendors – from quilted aluminum vending trucks at construction sites to ice cream trucks selling to children – have been around for decades. But enterprising restaurateurs have updated that model with splashy logos on delivery trucks retrofitted with kitchens. Through social media sites, patrons can track down their favorite trucks whenever the hankering for a hot fish taco or falafel wrap strikes.